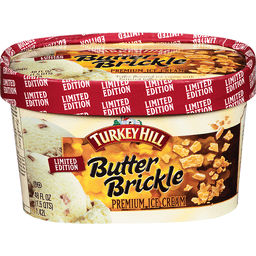 Turkey Hill® Premium Ice Cream Dark Chocolate Caramel Espresso. Limited edition. 48 fl oz (1.5 qts) 1.42L. Flavors. 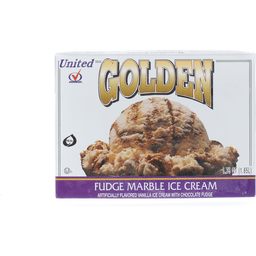 Turkey Hill has a time-honored tradition of making some of the best family favorite ice creams you can buy. But every so often, we like to whip up some novel creations to appeal to your sense of adventure. For an epic espresso adventure, dig into our rich espresso ice cream loaded with dark chocolate caramel truffles and generous ribbons of sea salted caramel. Enjoy the ultimate sweet and salty espresso adventure! Espresso ice cream with dark chocolate caramel truffles and a sea salted caramel swirl. 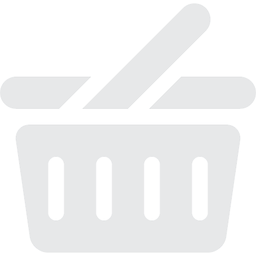 Let us know how you like our products at 800-MY DAIRY. Please provide code from bottom of cup. www.turkeyhill.com. 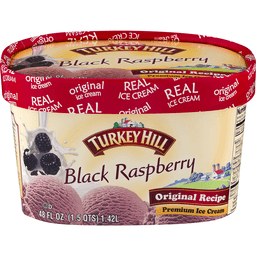 Turkey Hill® Black Raspberry Original Recipe Premium Ice Cream. Real ice cream. 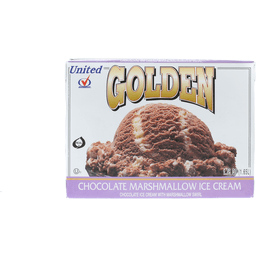 Original ice cream. Where we make it is why it's good. It all started in 1931 with just a few neighbors in Lancaster County, a place with rolling hills, friendly smiles and plenty of family heritage. Armor Frey founded Turkey Hill dairy on traditional values like faith, hard work and an unwavering commitment to quality. Today, our neighborhood has grown, and millions have come to trust Turkey Hill to mean the finest in frozen desserts and beverages. Raspberry ice cream made with flavorful raspberry puree. Quality pledge. All our products are made with the finest ingredients you would expect from Turkey Hill. We welcome your comments at 800-MY DAIRY or turkeyhill.com. Please provide code date from bottom of cup. Rich & creamy. Scooping since 1935. Making the world Friendly one scoop at a time! The Blake Brothers opened their first ice cream shop in 1935 and called it Friendly to provide a place where families & friends could create lasting memories while enjoying great tasting ice cream made with high quality ingredients. Today, we still source milk daily from local farms and use many of the Blakes' original recipes allowing you to share our scoop shop heritage with family at home! 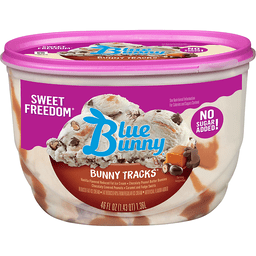 Please Send Comments to: Consumer Services Friendlys Ice Cream, LLC 1855 Boston Road Wilbraham, MA 01095. 1-800-966-9970 (toll free) or visit our website: www.friendlys.com. Enclose with All Correspondence: where product was purchased; product and date codes from package. Partially produced with genetic engineering. 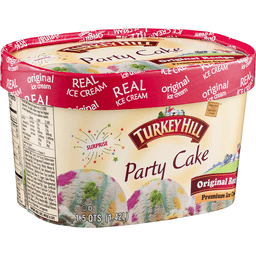 Turkey Hill Premium Ice Cream Party Cake. Naturally & artificially flavored. Real ice cream. Original recipe. 48 fl oz (1.5 qts) 1.42 L. Where we make it is why it's good. It all started in 1931 with just a few neighbors in Lancaster County, a place with rolling hills, friendly smiles and plenty of family heritage. Armor Frey founded Turkey Hill Dairy on traditional values like faith, hard work and an unwavering commitment to quality. Today, our neighborhood has grown, and millions have come to trust Turkey Hill to mean the finest in frozen desserts and beverages. Quality pledge: All our products are made with the finest ingredients you would expect from Turkey Hill. We welcome your comments at 800-MY DAIRY or Visit www.turkeyhill.com. Please provide code from cup. 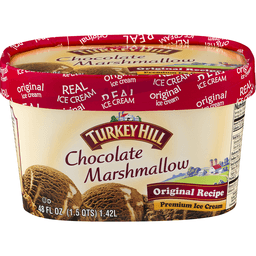 Turkey Hill® Original Recipe Chocolate Marshmallow Premium Ice Cream. Real ice cream. Original ice cream. Where we make it is why it's good. It all started in 1931 with just a few neighbors in Lancaster County, a place with rolling hills, friendly smiles and plenty of family heritage. Armor Frey founded Turkey Hill dairy on traditional values like faith, hard work and an unwavering commitment to quality. Today, our neighborhood has grown, and millions have come to trust Turkey Hill to mean the finest in frozen desserts and beverages. Dutch chocolate ice cream swirled with whipped marshmallow. Quality pledge: All our products are made with the finest ingredients you would expect from Turkey Hill. We welcome your comments at 800-MY DAIRY or turkeyhill.com. Please provide code date from bottom of cup. Sundae cone. Rich & creamy. Made with real ice cream. 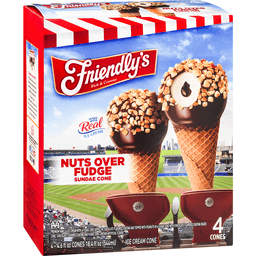 Premium vanilla ice cream with a fudge core dipped in chocolate flavored coating and topped with peanuts in a sugar cone with chocolate flavored coated inside. 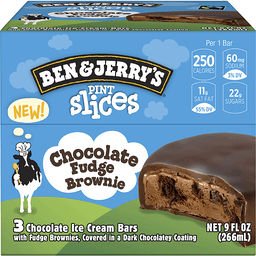 Cone, chocolate flavored coating and fudge core contain artificial flavor. Quality since 1935. 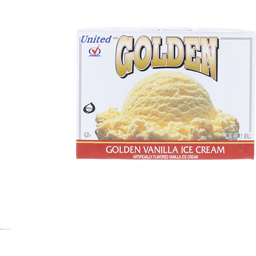 Friendly's has a rich heritage of deliciously creamy ice cream with quality ingredients. Reward your family with an authentic ice cream shop experience at home and make every occasion special. BFF, Best Friends of Friendly's: For free exclusive offers and news join Best Friends of Friendly's. Check us out at www.friendlys.com/bff. Connect with Friendly's: Facebook. Twitter. YouTube. Visit www.friendlys.com. Please Send Comments to: Consumer Services, Friendly's Ice Cream, LLC. Wilbraham, MA 01095 USA. 1-800-966-9970 (toll free) or visit our website: www.friendlys.com. Enclose product and date codes from package with correspondence. Inner units not labeled for retail sale. Partially produced with genetic engineering. Made in the USA. 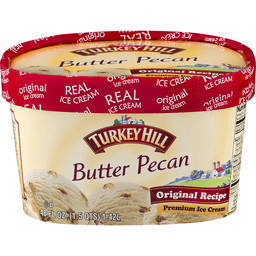 Turkey Hill® Original Recipe Premium Ice Cream Butter Pecan. Real ice cream. 48 fl oz (1.5 qts) 1.42 L. Where we make it is why it's good. It all started in 1931 with just a few neighbors in Lancaster Country, a place with rolling hills, friendly smiles and plenty of family heritage. Armor Frey founded Turkey Hill Dairy on traditional values like faith, hard work and an unwavering commitment to quality. Today, our neighborhood has grown, and millions have come to trust Turkey Hill to mean the finest in frozen desserts and beverages. 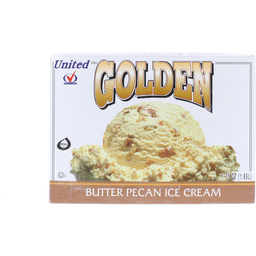 Butter pecan ice cream chock-full of butter-roasted pecans. Quality pledge: All our products are made with the finest ingredients you would expect from Turkey Hill. We welcome your Comments at 800-MY DAIRY or www.turkeyhill.com. Please provide code from cup. Naturally & artificially flavored. Real ice cream. Original ice cream. 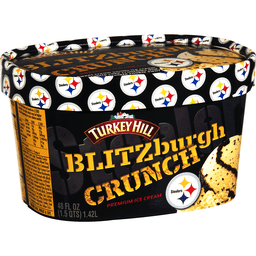 Premium ice cream with chocolate crunchies, chocolate cookie swirl and the rich flavor of vanilla. Where we make it is why it's good. It all started in 1931 with just a few neighbors in Lancaster County, a place with rolling hills, friendly smiles and plenty of family heritage. Armor Frey founded Turkey Hill Dairy on traditional values like faith, hard work and an unwavering commitment to quality. Today, our neighborhood has grown, and millions have come to trust Turkey Hill to mean the finest in frozen desserts and beverages. Quality Pledge: All our products are made with the finest ingredients you would expect from Turkey Hill. We welcome your comments at 800-My Dairy or turkeyhill.com. Please provide code date from bottom of cup. 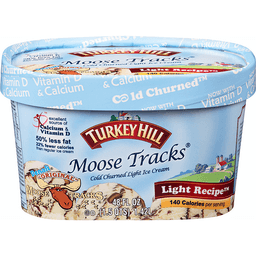 Turkey Hill® Moose Tracks® Light Recipe™ Cold Churned Light Ice Cream. Now with vitamin D & calcium. Cold Churned™ Excellent source of calcium & vitamin D. 50% less fat 22% fewer calories than regular ice cream. Denali® "original". 140 calories per serving. 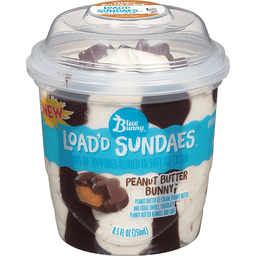 Vanilla light ice cream with peanut butter cups and famous Moose Tracks® fudge. Intelligent indulgence: Healthy eating is different in Lancaster County because we think healthy food should taste good. Our Light Recipe™ combines premium ingredients with a special cold-churn process to create light ice cream that both your waistline and your taste buds can love. Every serving is also an excellent source of calcium for strong teeth and bones and vitamin D to help your body absorb the calcium. Go ahead. We made indulgence intelligent! Fat reduced from 12g to 6g. Calories reduced from 180 to 140. 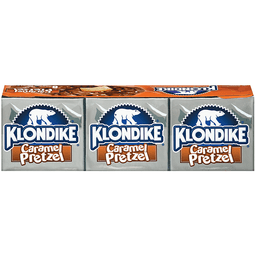 Moose Tracks® and Denali® are registered trademarks of Denali Flavors, Inc. Explore www.moosetracks.com. Quality pledge: All our products are made with the finest ingredients you would expect from Turkey Hill. We welcome your comments at 800-MY DAIRY or turkeyhill.com. Please provide code date from bottom of cup. 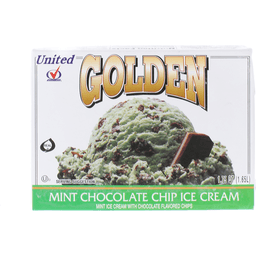 Mint ice cream. Fudge swirls. Mint chocolate cookie chunks. Artificial flavor added. New. 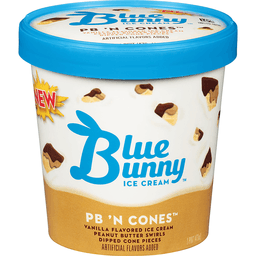 bluebunny.com. We welcome your questions or comments. Call us weekdays 8am to 5pm CST. Produced with genetic engineering. Years & years with bunny ears. Wells - Since 1913. What you see is what you'll love. So grab a spoon, dig in and see for yourself. From our family to yours, the most fun-filled ice cream in the world is made in Le Mars, Iowa. Friendwich. Rich & creamy. Made with real ice cream. Premium vanilla ice cream between two chocolate wafers. Chocolate wafers contain artificial flavor. Quality since 1935. 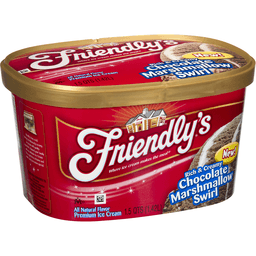 Friendly's has a rich heritage of deliciously creamy ice cream with quality ingredients. Reward your family with an authentic ice cream shop experience at home and make every occasion special. 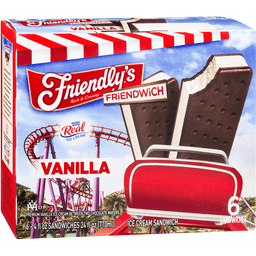 BFF, Best Friends of Friendly's: For free exclusive offers and news join Best Friends of Friendly's. Check us out at www.friendlys.com/bff. Connect with Friendly's: Facebook. Twitter. YouTube. Visit www.friendlys.com. Please Send Comments to: Consumer Services, Friendly's Ice Cream, LLC. Wilbraham, MA 01095 USA. 1-800-966-9970 (toll free) or visit our website: www.friendlys.com. Enclose product and date codes from package with correspondence. Inner units not labeled for retail sale. Made in the USA. 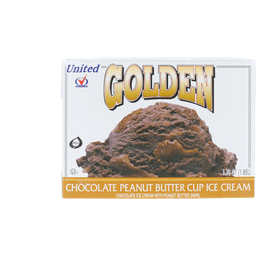 Friendly's® Peanut Butter Cup Premium Ice Cream. Scooping since 1935. Rich & creamy. Making the world Friendly one scoop at a time! The Blake Brothers opened their first ice cream shop in 1935 and called it 'Friendly' to provide a place where families & friends could create tasting memories while enjoying great tasting ice cream made with high quality ingredients. Today, we still source milk daily from local farms and use many of the Blakes' original recipes allowing you to share our scoop shop heritage with family at home! Partially produced with genetic engineering. 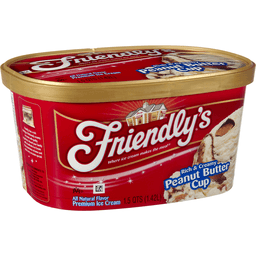 Please send comments to: Consumer Services Friendly's Ice Cream, LLC. 1855 Boston Road Wilbraham, MA 01095 USA. 1-800-966-9970 (toll free) or visit our website: www.friendlys.com. Enclose with all correspondence: Where product was purchased. Product and date codes from package. 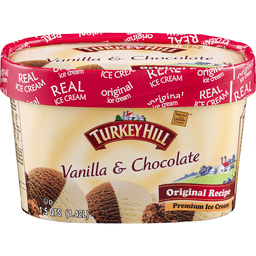 Turkey Hill Vanilla & Chocolate Premium Ice Cream. Original Ice Cream. Original Recipe. Naturally & Artificially Flavored. 48 FL OZ (1.5 QTS) 1.42L. Vanilla bean ice cream combines with chocolate ice cream. Where we make it is why it's good. It all started in 1931 with just a few neighbors in Lancaster county, a place with rolling hills, friendly smiles and plenty of family heritage. Armor frey founded Turkey Hill Dairy on traditional values like faith, hard work and an unwavering commitment to quality. Today, our neighborhood has grown, and millions have come to trust Turkey Hill to mean the finest in frozen desserts and beverages. Quality Pledge: All our products are made with the finest ingredients you would expect from Turkey hill. Please provide code date from bottom of cup. We welcome your comments at 800-MY DAIRY. www.turkeyhill.com. 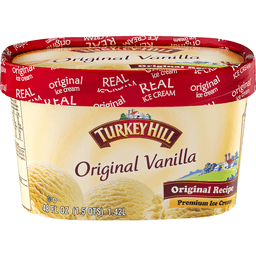 Turkey Hill Original Vanilla Premium Ice Cream. Naturally & artificially flavored. Real ice cream. 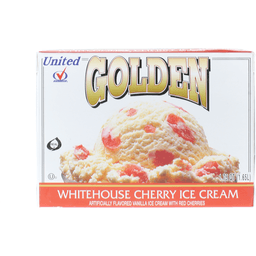 Original ice cream. Original recipe. 48 fl oz (1.5 qts) 1.42 L. Where we make it is why its good: It all started in 1931 with just a few neighbors in Lancaster County, a place with rolling hills, friendly smiles and plenty of family heritage. Armor Frey founded Turkey Hill Dairy on traditional values like faith, hard work and an unwavering commitment to quality. Today, our neighborhood has grown, and millions have come to trust Turkey Hill to mean the finest in frozen desserts and beverages. Quality pledge all our products are made with the finest ingredients you would expect from Turkey Hill. We welcome your comments at 800-MY DAIRY or turkeyhill.com. Please provide code date from bottom of cup. Peanut butter ice cream packed with peanut butter cup candies and rivers of peanut butter and fudge ribbons! Wells quality since 1913. Premium. 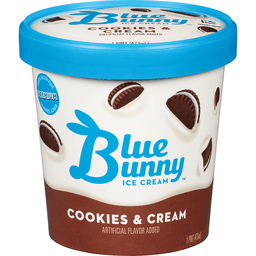 bluebunny.com. 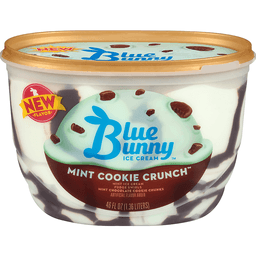 Blue Bunny is committed to providing the highest quality products possible. We welcome your questions or comments. 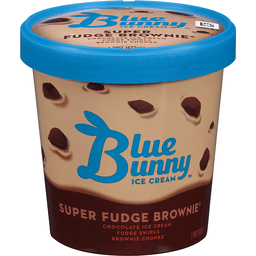 Visit us at bluebunny.com. 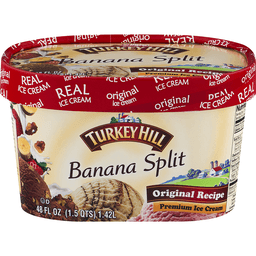 Turkey Hill Original Recipe Banana Split Premium Ice Cream. Real ice cream. Original ice cream. Where we make it is why it's good. It all started in 1931 with just a few neighbors in Lancaster County, a place with rolling hills, friendly smiles and plenty of family heritage. Armor Frey founded Turkey Hill dairy on traditional values like faith, hard work and an unwavering commitment to quality. Today, our neighborhood has grown, and millions have come to trust Turkey Hill to mean the finest in frozen desserts and beverages. Banana ice cream swirled with fudge, strawberry ice cream and chocolate ice cream with walnuts. Quality pledge: All our products are made with the finest ingredients you would expect from Turkey Hill. We welcome your comments at 800-MY DAIRY or turkeyhill.com. Please provide code from bottom of cup. 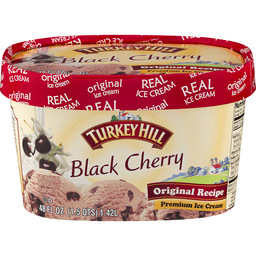 Turkey Hill® Black Cherry Original Recipe Premium Ice Cream. Original ice cream. Real ice cream. Naturally & artificially flavored. Where we make it is why it's good. It all started in 1931 with just a few neighbors in Lancaster County, a place with rolling hills, friendly smiles and plenty of family heritage. Armor Frey founded Turkey Hill Dairy on traditional values like faith, hard work and an unwavering commitment to quality. Today, our neighborhood has grown, and millions have come to trust Turkey Hill to mean the finest in frozen desserts and beverages. Vanilla flavored ice cream with plump black cherry slices. Quality pledge: All our products are made with the finest ingredients you would expect from Turkey Hill. We welcome your comments at 800-MY DAIRY or turkeyhill.com. Please provide code date from bottom of cup. Vanilla flavored ice cream. Peanut butter swirls. Dipped cone pieces. Artificial flavors added. New. 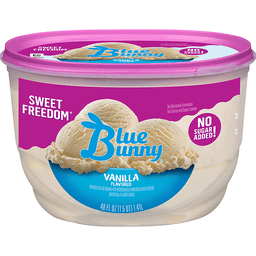 bluebunny.com. We welcome your questions or comments. Call us weekdays 8am to 5pm CST. Years & years with bunny ears. Since 1913. Produced with genetic engineering. Butter pecan flavor with other natural flavors and pecan pieces. 100 calories per serving. Sweetened with Splenda. See nutrition information for calorie & sugar content. Not a low calorie food. Per 1/2 Cup Serving: 100 calories; 2 g sat fat (10% DV); 90 mg sodium (4% DV); 4 g sugars. 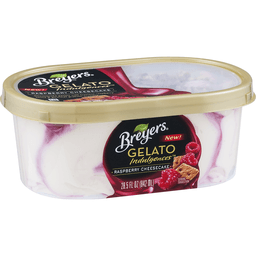 Breyers Pledge: At Breyers we put a lot of love into our products, and that is why we pledge to use only high quality ingredients. Founded 1866. 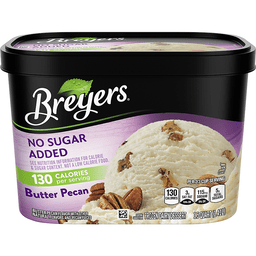 Breyers No Sugar Added flavors give you all the indulgently rich and creamy taste you love without the added sugar. Go ahead and enjoy! Find our recipes on yummly.com/breyers. Questions or Comments: 800-931-2826; breyers.com. Guarantee: If you are not satisfied with this product or have any questions or comments, please send the UPC code and stamped information from the bottom of this container to: Consumer Relations, Englewood Cliffs, NJ 07632 USA. Gluten free. 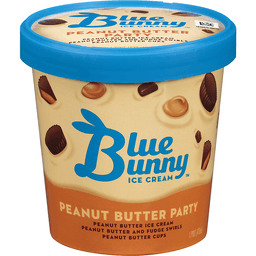 Peanut butter ice cream; peanut butter and fudge swirls; chocolaty peanut butter bunnies and cups. Tons of toppings buried in soft ice cream. Years & years with bunny ears. 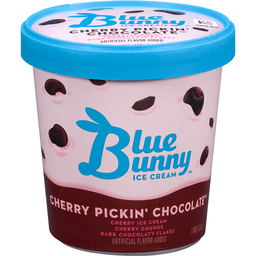 Since 1913. bluebunny.com. Scooping since 1935. Friendly's®. 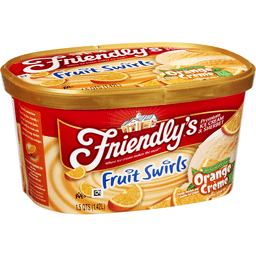 Rich & creamy orange creme fruit swirl. Orange sherbet and vanilla ice cream. Artificial coloring added. Premium ice cream & sherbet. 1.5 qt (1.42L). Making the world Friendly one scoop at a time! The Blake Brothers opened their first ice cream shop in 1935 and called it 'Friendly' to provide a place where families & friends could create lasting memories while enjoying great tasting ice cream made with high quality ingredients. Today, we still source milk daily from local farms and use many of the Blakes' original recipes allowing you to share our scoop shop heritage with family at home! Please send comments to: Consumer Services, Friendly Friendly's Ice Cream, LLC, 1855 Boston Road Wilbraham, MA 01095 USA. 1-800-966-9970 (toll free) or visit our website: www.friendlys.com. Enclose with all correspondence: Where product was purchased. Product and date codes from package. Partially produced with genetic engineering. 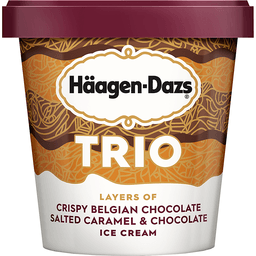 Haagen-Dazs® Trio Ice Cream Salted Caramel Chocolate. New. Layers of crispy Belgian chocolate. No rBST. Milk & cream from cows not treated with the growth hormone rBST**. 300 Calories per 1/2 cup. 14 fl oz (414 ml). Since 1960, our passion has been to transform the finest ingredients into extraordinary ice cream. Our Salted Caramel Chocolate TRIO weaves salted caramel and chocolate ice creams between crispy layers of Belgian chocolate for a uniquely rich indulgence. No GMO ingredients†. **No significant difference has been shown between milk from rBST treated and non-rBST treated cows. 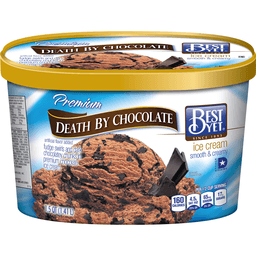 †SGS verified the nestle process for manufacturing this product with no GMO ingredients. Trademarks reproduced under license. Questions or Comments Text or Call 24/7 1-800-767-0120. Visit us at www.haagendazs.com. 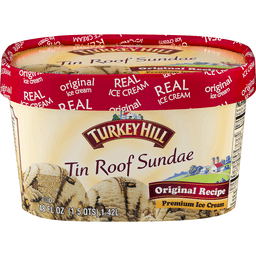 © HDIP, Inc.
Turkey Hill® Original Recipe Premium Ice Cream Tin Roof Sundae. Real ice cream. Naturally & artificially flavored. 48 fl oz (1.5 qts) 1.42 L. Where we make it is why it's good. It all started in 1931 with just a few neighbors in Lancaster Country, a place with rolling hills, friendly smiles and plenty of family heritage. Armor Frey founded Turkey Hill Dairy on traditional values like faith, hard work and an unwavering commitment to quality. Today, our neighborhood has grown, and millions have come to trust Turkey Hill to mean the finest in frozen desserts and beverages. Vanilla flavored ice cream swirled with chocolate fudge and choco peanuts. Quality pledge: All our products are made with the finest ingredients you would expect from Turkey Hill. We welcome your comments at 800-MY DAIRY or www.turkeyhill.com. Please provide code from cup. Vanilla flavored light ice cream. Chocolate flavored peanut butter bunnies. Chocolate flavored covered peanuts. Caramel and fudge swirls. Artificial flavor added. See nutrition information for sugars content. New. 1/2 the fat; 1/3 fewer calories than regular ice cream. 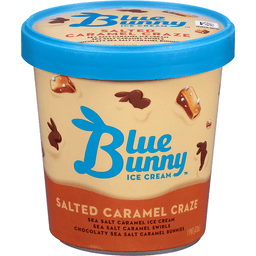 Per Serving: 140 calories; 23 g carbs (8% DV); 7 g total fat (11% DV). New. 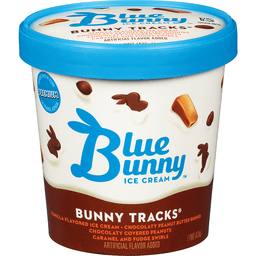 bluebunny.com. We welcome your questions or comments. Call us weekdays 8 am to 5 pm CST. 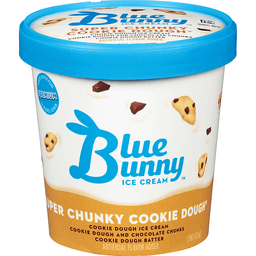 Fat reduced 56%, from 16 g to 7 g and calories reduced 46%, from 260 to 140 per serving from the leading national brands of ice cream. Produced with genetic engineering. Years & years with bunny ears. Wells - Since 1913. What you see is what you'll love. So grab a spoon, dig in and see for yourself. From our family to yours, the most fun-filled ice cream in the world is made in Le Mars, Iowa. Vanilla ice cream and white chocolate shards in a cracking white chocolate shell. Made with Belgian chocolate. New. 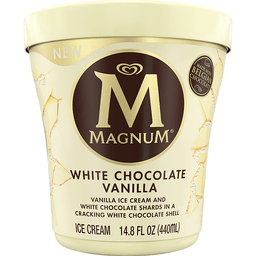 Visit us at www.magnumicecream.com. how2recycle.info. Product of Hungary. 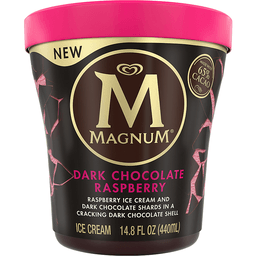 Raspberry ice cream and dark chocolate shards in a cracking dark chocolate shell. Made with 65% cacao. New. Visit us at www.magnumicecream.com. how2recycle.info. Squeeze to crack. Product of Hungary. 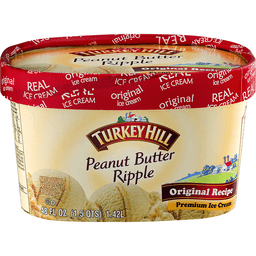 Turkey Hill Original Recipe Premium Ice Cream Peanut Butter Ripple. Real ice cream. Original ice cream. Naturally & artificially flavored. 48 fl oz (1.5 qts) 1.42 L. Where we make it is why it's good. It all started in 1931 with just a few neighbors in Lancaster Country, a place with rolling hills, friendly smiles and plenty of family heritage. Armor Frey founded Turkey Hill Dairy on traditional values like faith, hard work and an unwavering commitment to quality. Today, our neighborhood has grown, and millions have come to trust Turkey Hill to mean the finest in frozen desserts and beverages. Vanilla flavored ice cream swirled with roasted peanut butter. Quality pledge: All our products are made with the finest ingredients you would expect from Turkey Hill. Please provide code from cup. We welcome your Comments at 800-MY DAIRY or www.turkeyhill.com. Made with real ice cream. 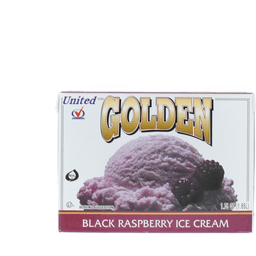 Premium black raspberry ice cream with chocolate flavored coating. Rich & creamy. Quality since 1935. 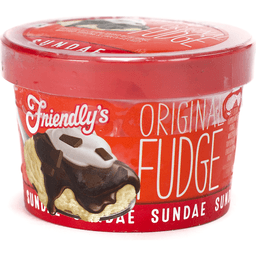 Friendly's has a rich heritage of deliciously creamy ice cream with quality ingredients. Reward your family with an authentic ice cream shop experience at home and make every occasion special. 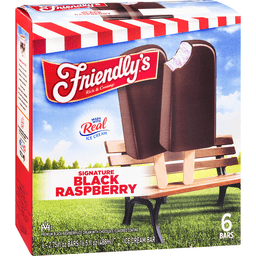 BFF, Best Friends of Friendly's: For free exclusive offers and news join Best Friends of Friendly's. Check us out at www.friendlys.com/bff. Connect with Friendly's: Facebook. Twitter. YouTube. Visit www.friendlys.com. Please Send Comments to: Consumer Services, Friendly's Ice Cream, LLC, Wilbraham, MA 01095 USA. 1-800-966-9970 (toll free) or visit our website: www.friendlys.com. Enclose product and date codes from package with correspondence. Inner units not labeled for retail sale. Made in the USA.